For the Canadian politician, see Robert Baden Powell (politician). "Baden-Powell" and "B-P" redirect here. For other uses of the surname, see Baden Powell (disambiguation). For alternate uses of "BP", see BP (disambiguation). Lieutenant-General Robert Stephenson Smyth Baden-Powell, 1st Baron Baden-Powell, OM, GCMG, GCVO, KCB, DL (/ˈbeɪdən ˈpoʊəl/ BAY-dən POH-əl; 22 February 1857 – 8 January 1941) was a British Army officer, writer, founder and first Chief Scout of the world-wide Boy Scout Movement, and founder, with his sister Agnes, of the world-wide Girl Guide / Girl Scout Movement. 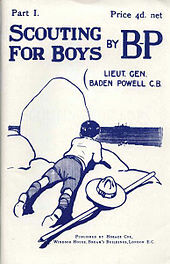 Baden-Powell authored the first editions of the seminal work Scouting for Boys, which was an inspiration for the Scout Movement. Educated at Charterhouse in Surrey, Baden-Powell served in the British Army from 1876 until 1910 in India and Africa. In 1899, during the Second Boer War in South Africa, Baden-Powell successfully defended the town in the Siege of Mafeking. Several of his military books, written for military reconnaissance and scout training in his African years, were also read by boys. In 1907, he held a demonstration camp, the Brownsea Island Scout camp, which is now seen as the beginning of Scouting. Based on his earlier books, particularly Aids to Scouting, he wrote Scouting for Boys, published in 1908 by Sir Arthur Pearson, for boy readership. In 1910 Baden-Powell retired from the army and formed The Boy Scouts Association. The first Scout Rally was held at The Crystal Palace in 1909, at which appeared a number of girls in Scout uniform, who told Baden-Powell that they were the "Girl Scouts", following which, in 1910, Baden-Powell and his sister Agnes Baden-Powell started the Girl Guides Movement. In 1912 he married Olave St Clair Soames. He gave guidance to the Scouting and Girl Guiding Movements until retiring in 1937. Baden-Powell lived his last years in Nyeri, Kenya, where he died and was buried in 1941. His grave is now a National Monument. Baden-Powell's father was the Reverend Professor Baden Powell, a prominent mathematician and theologian, whose family originated in Suffolk. His mother was Henrietta Grace, daughter of Admiral William Henry Smyth whose earliest known Smyth ancestor was a Royalist American colonist; her mother's father Thomas Warington was the British Consul in Naples around 1800. 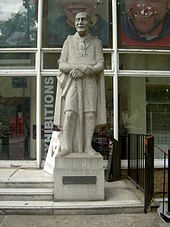 Baden-Powell was born as Robert Stephenson Smyth Powell at 6 Stanhope Street (now 11 Stanhope Terrace), Paddington in London, on 22 February 1857. He was called Stephe (pronounced "Stevie") by his family. He was named after his godfather, Robert Stephenson, the railway and civil engineer, and his third name was his mother's maiden name. Baden-Powell was the son of The Reverend Baden Powell, Savilian Professor of Geometry at Oxford University and Church of England priest and his third wife, Henrietta Grace Smyth (3 September 1824 – 13 October 1914), eldest daughter of Admiral William Henry Smyth. After Powell died in 1860, to identify her children with her late husband's fame, and to set her own children apart from their half-siblings and cousins, his mother styled the family name Baden-Powell. The name was eventually legally changed by Royal Licence on 30 April 1902. Baden-Powell had four older half-siblings from the second of his father's two previous marriages, and six full siblings Warington (1847–1921), George (1847–1898), the often-ill Augustus ("Gus") (1849–1863), Francis ("Frank") (1850–1933), Agnes (1858–1945) and Baden (1860–1937), as well as three others (Henrietta Smyth, 28 Oct 1851 – 9 March 1854; John Penrose Smyth, 21 December 1852 – 14 December 1855; and Jessie Smyth 25 November 1855 – 24 July 1856), who had all died very young before he was born. Baden-Powell's father died when he was three. Subsequently, Baden-Powell was raised by his mother, a strong woman who was determined that her children would succeed. In 1933 he said of her "The whole secret of my getting on, lay with my mother." Baden-Powell attended Rose Hill School, Tunbridge Wells. He was given a scholarship to Charterhouse, a prestigious public school. He played the piano and violin, was an ambidextrous artist, and enjoyed acting. Holidays were spent on yachting or canoeing expeditions with his brothers. His first introduction to Scouting skills was through stalking and cooking game while avoiding teachers in the nearby woods, which were strictly out-of-bounds. In 1876 Baden-Powell joined the 13th Hussars in India with the rank of lieutenant. He enhanced and honed his military scouting skills amidst the Zulu in the early 1880s in the Natal province of South Africa, where his regiment had been posted, and where he was Mentioned in Despatches. During one of his travels, he came across a large string of wooden beads. Although Baden-Powell claimed the beads had been those of the Zulu king Dinizulu, one researcher learned from Baden-Powell's diary that he had taken beads from a dead woman's body around that time and indeed the bead form is more similar to dowry beads than to warrior beads. The beads were later incorporated into the Wood Badge training programme he started after he founded the Scouting Movement. Baden-Powell's skills impressed his superiors and in 1890 he was brevetted Major as Military Secretary and senior Aide-de-camp to the Commander-in-Chief and Governor of Malta, his uncle General Sir Henry Augustus Smyth. He was posted to Malta for three years, also working as intelligence officer for the Mediterranean for the Director of Military Intelligence. He frequently travelled disguised as a butterfly collector, incorporating plans of military installations into his drawings of butterfly wings. In 1884 he published Reconnaissance and Scouting. 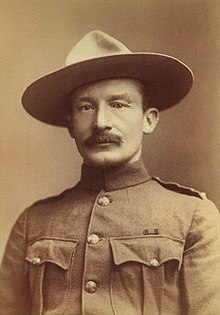 Baden-Powell returned to Africa in 1896, and served in the Second Matabele War, in the expedition to relieve British South Africa Company personnel under siege in Bulawayo. This was a formative experience for him not only because he commanded reconnaissance missions into enemy territory in the Matopos Hills, but because many of his later Boy Scout ideas took hold here. It was during this campaign that he first met and befriended the American scout Frederick Russell Burnham, who introduced Baden-Powell to stories of the American Old West and woodcraft (i.e. scoutcraft), and here that he wore his signature Stetson campaign hat and neckerchief for the first time. Baden-Powell was accused of illegally executing a prisoner of war in 1896, the Matabele chief Uwini, who had been promised his life would be spared if he surrendered. Uwini was sentenced to be shot by firing squad by a military court, a sentence Baden-Powell confirmed. Baden-Powell was cleared by a military court of inquiry but the colonial civil authorities wanted a civil investigation and trial. Baden-Powell later claimed he was "released without a stain on my character". Baden-Powell was also accused of allowing native African warriors under his command to massacre enemy prisoners including women, children and non-combatants. After Rhodesia, Baden-Powell served in the Fourth Ashanti War in Gold Coast. In 1897, at the age of 40, he was brevetted colonel (the youngest colonel in the British Army) and given command of the 5th Dragoon Guards in India. A few years later he wrote a small manual, entitled Aids to Scouting, a summary of lectures he had given on the subject of military scouting, much of it a written explanation of the lessons he had learned from Burnham, to help train recruits. Using this and other methods he was able to train them to think independently, use their initiative, and survive in the wilderness. 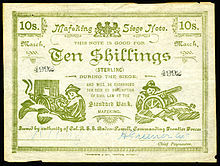 Siege of Mafeking, 10 Shillings (1900), Boer War currency issued by authority of Colonel Robert Baden-Powell. Baden-Powell returned to South Africa before the Second Boer War and was engaged in further military actions against the Zulus. Although instructed to maintain a mobile mounted force on the frontier with the Boer republics, Baden-Powell amassed stores and a garrison at Mafeking. While engaged in this, he and much of his intended mobile force was at Mafeking when it was surrounded by a Boer army, at times in excess of 8,000 men. Baden-Powell was the garrison commander during the subsequent Siege of Mafeking, which lasted 217 days. Although Baden-Powell could have destroyed his stores and had sufficient forces to break out throughout much of the siege, especially since the Boers lacked adequate artillery to shell the town or its forces, he remained in the town to the point of his intended mounted soldiers eating their horses. The siege of the small town received undue attention from both the Boers and international media because Lord Edward Cecil, the son of the British Prime Minister, was besieged in the town. The garrison held out until relieved, in part thanks to cunning deceptions, many devised by Baden-Powell. Fake minefields were planted and his soldiers pretended to avoid non-existent barbed wire while moving between trenches. Baden-Powell did much reconnaissance work himself. In one instance, noting that the Boers had not removed the rail line, Baden-Powell loaded an armoured locomotive with sharpshooters and sent it down the rails into the heart of the Boer encampment and back again in a successful attack. Contrary views of Baden-Powell's actions during the siege argue that his success in resisting the Boers was secured at the expense of the lives of the native African soldiers and civilians, including members of his own African garrison. Pakenham stated that Baden-Powell drastically reduced the rations to the native garrison. However, in 2001, after subsequent research, Pakenham decidedly retreated from this position. During the siege, the Mafeking Cadet Corps of white boys below fighting age stood guard, carried messages, assisted in hospitals, and so on, freeing grown men to fight. Baden-Powell did not form the Cadet Corps himself, and there is no evidence that he took much notice of them during the Siege. But he was sufficiently impressed with both their courage and the equanimity with which they performed their tasks to use them later as an object lesson in the first chapter of Scouting for Boys. The siege was lifted on 16 May 1900. Baden-Powell was promoted to major-general, and became a national hero. However, the British military commanders were more critical of his performance and even less impressed with his subsequent choices to again allow himself to be besieged. Ultimately, his failure to properly understand the situation and abandonment of the soldiers, mostly Australians and Rhodesians, at the Battle of Elands River led to his being removed from action. 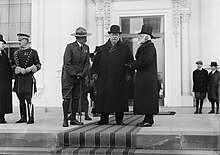 Briefly back in the United Kingdom in October 1901, Baden-Powell was invited to visit King Edward VII at Balmoral, the monarch's Scottish retreat, and personally invested as Companion of the Order of the Bath (CB). The Order of the Bath is the fourth-most senior of the British Orders of Chivalry. Baden-Powell was further sidelined from active command and given the role of organising the South African Constabulary, a colonial police force. He returned to England to take up a post as Inspector-General of Cavalry in 1903. While holding this position, Baden-Powell was instrumental in reforming reconnaissance training in British cavalry, giving the force an important advantage in scouting ability over continental rivals. Also during this appointment, Baden-Powell selected the location of Catterick Garrison to replace Richmond Castle which was then the Headquarters of the Northumbrian Division. In 1907 he was promoted to Lieutenant-General but was left on the inactive list. Eventually he was appointed to the lowly command of the Northumbrian Division of the newly formed Territorial Force. In 1910, after being rebuked for a series of what were regarded as publicity gaffes, one suggesting invasion by Germany, Baden-Powell retired from the Army. Baden-Powell later claimed[dubious – discuss] he was advised by King Edward VII that he could better serve his country by promoting Scouting. 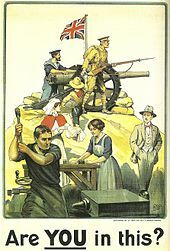 On the outbreak of World War I in 1914, at the age of fifty-seven, Baden-Powell put himself at the disposal of the War Office. No command was given to him. It has been claimed[dubious – discuss] that Lord Kitchener said: "he could lay his hand on several competent divisional generals but could find no one who could carry on the invaluable work of the Boy Scouts". It was rumoured that Baden-Powell was engaged in spying and Baden-Powell claimed[dubious – discuss] that intelligence officers spread this myth. On his return from Africa in 1903, Baden-Powell found that his military training manual, Aids to Scouting, had become a best-seller, and was being used by teachers and youth organisations, including Charlotte Mason's House of Education. Following his involvement in the Boys' Brigade as a Brigade Vice-President and Officer in charge of its scouting section, with encouragement from his friend, William Alexander Smith, Baden-Powell decided to re-write Aids to Scouting to suit a youth readership. In August 1907 he held a camp on Brownsea Island to test out his ideas. About twenty boys attended: eight from local Boys' Brigade companies, and about twelve public school boys, mostly sons of his friends. Baden-Powell was also influenced by Ernest Thompson Seton, who founded the Woodcraft Indians. Seton gave Baden-Powell a copy of his book The Birch Bark Roll of the Woodcraft Indians and they met in 1906. The first book on the Scout Movement, Baden-Powell's Scouting for Boys was published in six instalments in 1908, and has sold approximately 150 million copies as the fourth best-selling book of the 20th century. Boys and girls spontaneously formed Scout troops and the Scouting Movement had inadvertently started, first as a national, and soon an international phenomenon. A rally of Scouts was held at Crystal Palace in London in 1909, at which Baden-Powell met some of the first Girl Scouts. 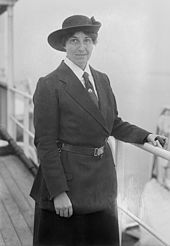 The Girl Guides were subsequently formed in 1910 under the auspices of Baden-Powell's sister, Agnes Baden-Powell. Baden-Powell's friend Juliette Gordon Low was encouraged by him to found the Girl Scouts of the USA. In 1920, the 1st World Scout Jamboree took place in Olympia in West Kensington, and Baden-Powell was acclaimed Chief Scout of the World. Baden-Powell was created a Baronet in 1921 and Baron Baden-Powell, of Gilwell, in the County of Essex, on 17 September 1929, Gilwell Park being the International Scout Leader training centre. After receiving this honour, Baden-Powell mostly styled himself "Baden-Powell of Gilwell". In 1929, during the 3rd World Scout Jamboree, he received as a present a new 20-horsepower Rolls-Royce car (chassis number GVO-40, registration OU 2938) and an Eccles Caravan. This combination well served the Baden-Powells in their further travels around Europe. The caravan was nicknamed Eccles and is now on display at Gilwell Park. The car, nicknamed Jam Roll, was sold after his death by Olave Baden-Powell in 1945. Jam Roll and Eccles were reunited at Gilwell for the 21st World Scout Jamboree in 2007. Recently it has been purchased on behalf of Scouting and is owned by a charity, B-P Jam Roll Ltd. Funds are being raised to repay the loan that was used to purchase the car. Baden-Powell also had a positive impact on improvements in youth education. Under his dedicated command the world Scouting movement grew. By 1922 there were more than a million Scouts in 32 countries; by 1939 the number of Scouts was in excess of 3.3 million. At the 5th World Scout Jamboree in 1937, Baden-Powell gave his farewell to Scouting, and retired from public Scouting life. 22 February, the joint birthday of Robert and Olave Baden-Powell, continues to be marked as Founder's Day by Scouts and Thinking Day by Guides to remember and celebrate the work of the Chief Scout and Chief Guide of the World. I have had a most happy life and I want each one of you to have a happy life too. I believe that God put us in this jolly world to be happy and enjoy life. Happiness does not come from being rich, nor merely being successful in your career, nor by self-indulgence. One step towards happiness is to make yourself healthy and strong while you are a boy, so that you can be useful and so you can enjoy life when you are a man. Nature study will show you how full of beautiful and wonderful things God has made the world for you to enjoy. Be contented with what you have got and make the best of it. Look on the bright side of things instead of the gloomy one. But the real way to get happiness is by giving out happiness to other people. Try and leave this world a little better than you found it and when your turn comes to die, you can die happy in feeling that at any rate you have not wasted your time but have done your best. "Be prepared" in this way, to live happy and to die happy – stick to your Scout Promise always – even after you have ceased to be a boy – and God help you to do it. In January 1912, Baden-Powell was en route to New York on a Scouting World Tour, on the ocean liner SS Arcadian, when he met Olave St Clair Soames. She was 23, while he was 55; they shared the same birthday, 22 February. They became engaged in September of the same year, causing a media sensation due to Baden-Powell's fame. To avoid press intrusion, they married in private on 30 October 1912, at St Peter's Church in Parkstone. The Scouts of England each donated a penny to buy Baden-Powell a wedding gift, a car (note that this is not the Rolls-Royce they were presented with in 1929). There is a monument to their marriage inside St Mary's Church, Brownsea Island. Baden-Powell and Olave lived in Pax Hill near Bentley, Hampshire from about 1919 until 1939. The Bentley house was a gift of her father. Directly after he had married, Baden-Powell began to suffer persistent headaches, which were considered by his doctor to be of psychosomatic origin and treated with dream analysis. The headaches disappeared upon his moving into a makeshift bedroom set up on his balcony. In 1939, Baden-Powell and Olave moved to a cottage he had commissioned in Nyeri, Kenya, near Mount Kenya, where he had previously been to recuperate. 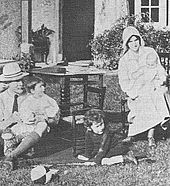 The small one-room house, which he named Paxtu, was located on the grounds of the Outspan Hotel, owned by Eric Sherbrooke Walker, Baden-Powell's first private secretary and one of the first Scout inspectors. Walker also owned the Treetops Hotel, approximately 17 km out in the Aberdare Mountains, often visited by Baden-Powell and people of the Happy Valley set. The Paxtu cottage is integrated into the Outspan Hotel buildings and serves as a small Scouting museum. 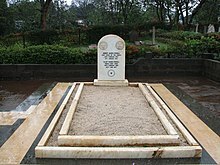 Baden-Powell died on 8 January 1941 and is buried at St Peter's Cemetery in Nyeri. His gravestone bears a circle with a dot in the centre "ʘ", which is the trail sign for "Going home", or "I have gone home". His wife Olave moved back to England in 1942, although when she died (in 1977), her ashes were sent to Kenya and interred beside her husband. The Kenyan government has declared Baden-Powell's grave a national monument. In addition, when Olave's sister Auriol Davidson (née Soames) died in 1919, Olave and Robert took her three nieces, Christian (1912–1975), Clare (1913–1980), and Yvonne (1918–1995? ), into their family and brought them up as their own children. 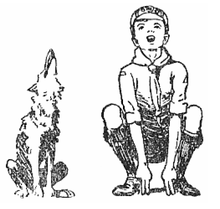 One of Baden-Powell's illustrations from The Wolf Cub Handbook, 1916. Baden-Powell published books and other texts during his years of military service both to finance his life and to generally educate his men. Baden-Powell was regarded as an excellent storyteller. During his whole life he told "ripping yarns" to audiences. After having published Scouting for Boys, Baden-Powell kept on writing more handbooks and educative materials for all Scouts, as well as directives for Scout Leaders. In his later years, he also wrote about the Scout movement and his ideas for its future. He spent most of the last two years of his life in Africa, and many of his later books had African themes. Most of his books (the American editions) are available on-line. Baden-Powell inherited his artistic talent from his father, who, at meetings, was wont to sketch caricatures of those present, and from his mother, whose mother was also artistic. Baden-Powell painted or sketched almost every day of his life. Most of his works have a humorous or informative character. Baden-Powell was a consummate artist, and his books are scattered with his pen-and-ink sketches, frequently whimsical. He did an large unknown number of pen-and-ink sketches; he always travelled with a "sketchpad" that he used frequently, sometimes pencil sketches, sometimes "cartoons" for later water-colour paintings. He also created a few sculpture. Unfortunately, there is no catalogue of his works, many of which appear in his books, and twelve paintings hang in the British Scout Headquarters at Gilwell Park. In 1911 & 1912, he had fishing holidays in Norway. His two sketchbooks were given by his widow to the Scouts of Norway, who have produced a very limited edition facsimile of both. There was an exhibition of his work at the Willmer House Museum, Farnham, Surrey, from 11 April - 12 May, 1967; unfortunately the catalogue is text-only. Currently, many pages of his field diary, complete with drawings, are on display at the National Scouting Museum in Irving, Texas. In 1937 Baden-Powell was appointed to the Order of Merit, one of the most exclusive awards in the British honours system, and he was also awarded 28 decorations by foreign states, including the Grand Officer of the Portuguese Order of Christ, the Grand Commander of the Greek Order of the Redeemer (1920), the Commander of the French Légion d'honneur (1925), the First Class of the Hungarian Order of Merit (1929), the Grand Cross of the Order of the Dannebrog of Denmark, the Grand Cross of the Order of the White Lion, the Grand Cross of the Order of the Phoenix, and the Order of Polonia Restituta. The Silver Wolf Award worn by Robert Baden-Powell is handed down the line of his successors, with the current Chief Scout, Bear Grylls, wearing this original award. The Bronze Wolf Award, the only distinction of the World Organization of the Scout Movement, awarded by the World Scout Committee for exceptional services to world Scouting, was first awarded to Baden-Powell by a unanimous decision of the then International Committee on the day of the institution of the Bronze Wolf in Stockholm in 1935. He was also the first recipient of the Silver Buffalo Award in 1926, the highest award conferred by the Boy Scouts of America. In 1931 Baden-Powell received the highest award of the First Austrian Republic (Großes Ehrenzeichen der Republik am Bande) out of the hands of President Wilhelm Miklas. :101 Baden-Powell was also one of the first and few recipients of the Goldene Gemse, the highest award conferred by the Österreichischer Pfadfinderbund. In 1931, Major Frederick Russell Burnham dedicated Mount Baden-Powell in California to his old Scouting friend from forty years before. Today their friendship is honoured in perpetuity with the dedication of the adjoining peak, Mount Burnham. Baden-Powell was nominated for the Nobel Peace Prize on numerous occasions, including 10 separate nominations in 1928. He was awarded the Wateler Peace Prize in 1937. In 2002, Baden-Powell was named 13th in the BBC's list of the 100 Greatest Britons following a UK-wide vote. As part of the Scouting 2007 Centenary, Nepal renamed Urkema Peak to Baden-Powell Peak. The family name legally changed from Powell to Baden-Powell by Royal Licence on 30 April 1902. 1929–1937: Lieutenant-General The Right Honourable The Lord Baden-Powell, GCMG, GCVO, KCB, KStJ, Bt. 1937–1941: Lieutenant-General The Right Honourable The Lord Baden-Powell, OM, GCMG, GCVO, KCB, KStJ, Bt. Not shown here. Dexter: an Officer of 13th/18th Hussars in full dress his Sword drawn over his shoulder proper; sinister: a Boy Scout holding a Staff also proper. Ar Nyd Yw Pwyll Pyd Yw (Where there is steadiness, there will be a Powell). This page is based on the Wikipedia article Robert Baden-Powell, 1st Baron Baden-Powell; it is used under the Creative Commons Attribution-ShareAlike 3.0 Unported License (CC-BY-SA). You may redistribute it, verbatim or modified, providing that you comply with the terms of the CC-BY-SA.